While the place and time of the onion's origin are still a mystery, there are many documents, from very early times, which describe its importance as a food and its use in art, medicine and mummification. Because onions are small and their tissues leave little or no trace, there is no conclusive opinion about the exact location and time of their birth. Many archaeologists, botanists and food historians believe onions originated in central Asia. Other research suggests that onions were first grown in Iran and West Pakistan. It is presumed that our predecessors discovered and started eating wild onions very early long before farming or even writing was invented. Very likely, this humble vegetable was a staple in the prehistoric diet. Most researchers agree that the onion has been cultivated for 5000 years or more. Since onions grew wild in various regions, they were probably consumed for thousands of years and domesticated simultaneously all over the world. Onions may be one of the earliest cultivated crops because they were less perishable than other foods of the time, were transportable, were easy to grow and could be grown in a variety of soils and climates. In addition, the onion was useful for sustaining human life. Onions prevented thirst and could be dried and preserved for later consumption when food might be scarce. 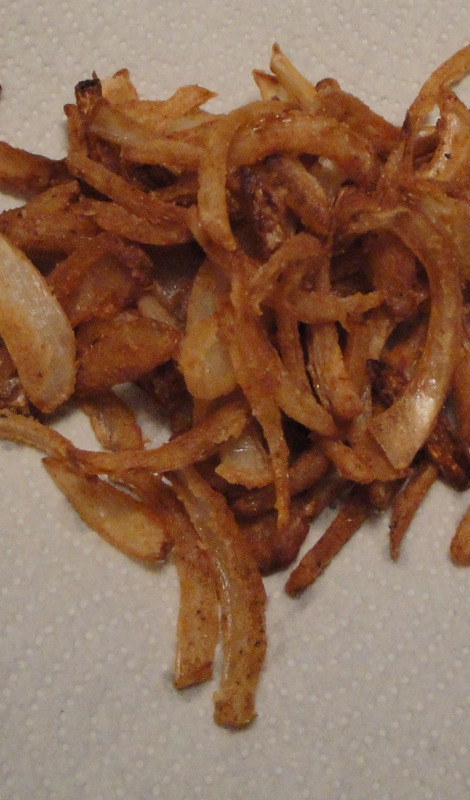 Ready for these tasty onion strings. Your family will be asking for more. So good! In Dutch oven, preheat oil to 350 degrees. Slice the onion very thin. Spread onions out and sprinkle with seasoned salt and pepper. Place the flour in a resealable plastic bag. Place the onion strings in the bag, close and shake until onions strings are coated. 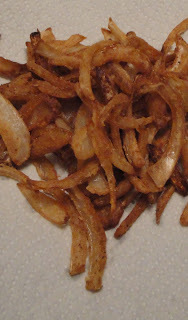 Fry onion strings in batches, for 3 to 4 minutes, until brown and crispy. Remove with spider kitchen utensil and drain on paper towels. Sprinkle salt, if desired. Enjoy! I love your blogs, great recipes, and always interesting! At this point, where they originated isn't a concern, Christine. If they show up on our dinner table is! :) Great recipe and intriguing history.